Two very different galaxies drift through space together in this image taken by NASA's Hubble Space Telescope. The peculiar galaxy pair is called Arp 116. Arp 116 is composed of a giant elliptical galaxy known as Messier 60 (or M60) and a much smaller spiral galaxy, NGC 4647. M60 is the third brightest galaxy in the Virgo cluster of galaxies, a collection of more than 1,300 galaxies. M60 has a diameter of 120,000 light-years, and a mass of about one trillion times that of the Sun. A huge black hole of 4.5 billion solar masses lies at its center, one of the most massive black holes ever found. The faint bluish spiral galaxy NGC 4647 is about two-thirds of M60 in size and much lower in mass — roughly the size of our galaxy, the Milky Way. Astronomers have long tried to determine whether these two galaxies are actually interacting. Although looking at them from Earth they overlap, there is no evidence of new star formation, which would be one of the clearest signs that the two galaxies are indeed interacting. However, recent studies of very detailed Hubble images suggest the onset of some tidal interaction between the two. 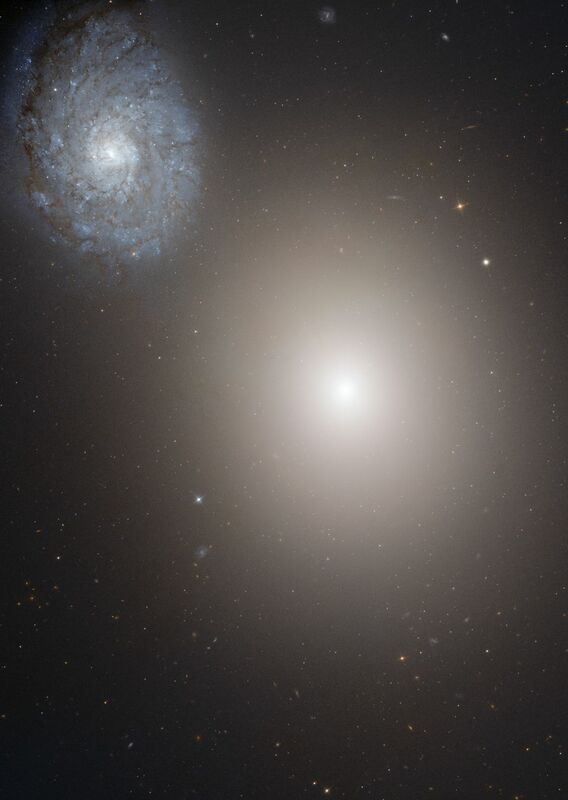 M60 lies roughly 54 million light-years away from Earth; NGC 4647 is about 63 million light-years away. 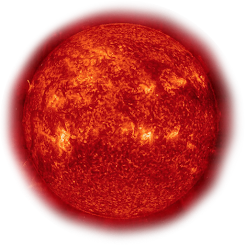 This image combines exposures from Hubble's Advanced Camera for Surveys and Wide Field and Planetary Camera 2.